On Thursday 8th November 2007, HRH Prince Philip, The Duke of Edinburgh, opened the Field of Remembrance at Westminster Abbey for all the UK armed services, past and present. The Association remembers former soldiers of the Regiment at this solemn occasion by planting remembrance crosses in the area provided by the Combined Irish Regiments Association. 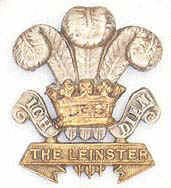 The plot is shared with the Royal Dublin Fusiliers. The Leinster Regiment Association make an annual £50 donation to the Combined Irish Regiments Association toward its upkeep. Each year the Association randomly chooses names of fallen soldiers and together with the remembrance poppy crosses from the extended families of Leinster Soldiers, these form the basis of the Leinster Commemoration.